Iron is an essential nutrient that helps the body grow and function properly. It helps forming the red blood cells since it is an important component of the oxygen carrying protein known as hemoglobin. Therefore, the main function of iron is to assist in carrying oxygen to different parts of the body through the blood. In this way, it is ensured that all the organs are getting their due share of oxygen which helps them to extract energy from food substances. In addition, the mineral is also immensely important in building and strengthening the body’s muscles as it is a component of myoglobin – the protein which delivers oxygen to muscles. For children in their growing years, iron is essential as it helps their growth and development. Therefore, the mineral is very important for children of all ages in order to achieve various developmental milestones. Iron drops for infants and toddlers. Tablet supplement for older children and teenagers. Babies between 7-12 months require an intake of 11 mg of iron. Toddlers aging 1-3 years require 7 mg.
Children between 4-8 years need intake of 19 mg in their diet. Between the age of 9-13 years, 8 mg is the basic requirement. Teenage girls between 14-18 years require 15 mg. 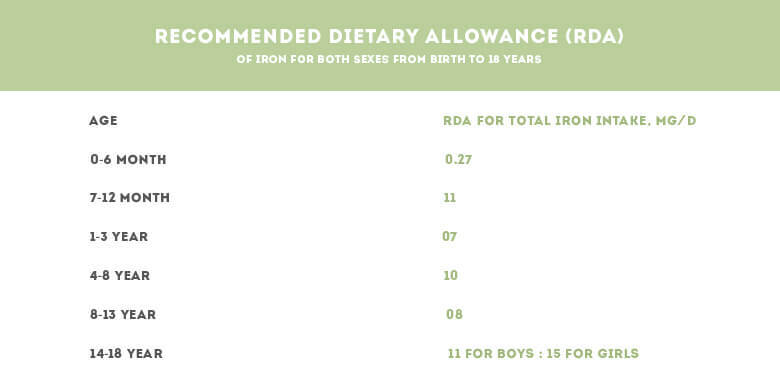 Boys between 14-18 years need to take 11 mg of iron everyday. Insufficient intake of iron will lead to iron deficiency in children. Unable to maintain their body temperature. Increased craving for ice, dirt, starch and other non-nutritive substances. If any of these signs appears, children must be taken to their pediatricianor specialist for blood tests to check their iron levels. Premature babies or the babies who have a low birth weight are more likely to develop iron deficiency. Babies who start drinking cow’s milk before the age of 1. Babies who are breast-fed but are not given proper complimentary food containing iron after 6 months. Babies who are on a formula not fortified with iron. Children having a particular health condition, like a protracted infection. The children who are exposed to lead. Drinking more than 24 ounces of cow, goat or soy milk can also lead to iron deficiency in children. Teenage girls are also vulnerable to this deficiency once their menstruation starts. The loss of blood can make them iron deficient. Make sure your child is eating everything. From green vegetables to meat, poultry, fish, oats to iron fortified cereals and breads, try to include a little bit of everything in their diet. From six months onwards when you introduce solids to your child, make sure they get a taste of everything. Older children can take a variety of other food that is iron rich. Both natural foods and the ones fortified with iron are essential for children to grow and develop properly. If you think your child is not getting enough iron from his/her diet, don’t hesitate to consult the doctor about starting oral supplements. 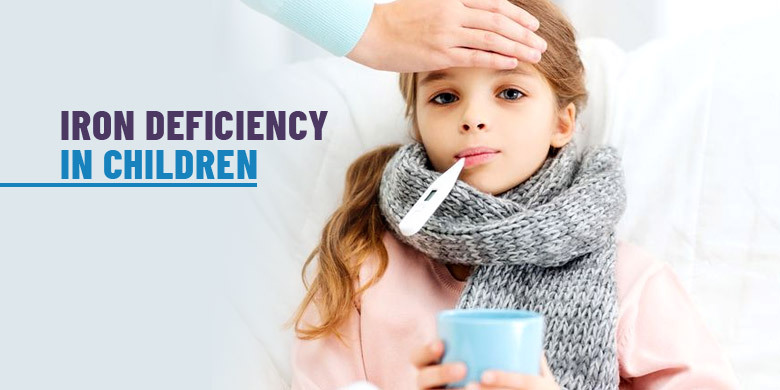 If a child is taking sufficient amount of iron and still showing symptoms of deficiency parents may consider to improve the absorption of iron in his/her body. Many a time even if we are consuming enough iron, our bodies are incapable of absorbing it, hence leaving us iron deficient. The best and the easiest way to increase iron absorption in the body is to increase vitamin C intake. Vitamin C helps the body to absorb dietary iron. In order to increase vitamin C level in the body introduce fruits like melons, strawberries, kiwi, broccoli, potatoes and tomatoes etc. Iron in breast milk is easily absorbed by the baby’s body as compared to formula. This is one of the many reasons why breast feeding is recommended for at least one year. If your baby is on formula, make sure to use an iron fortified formula. Cow’s milk is not a good source of iron for babies. This is why cow’s milk should not be introduced to babies especially before they turn one. If you must introduce cow’s milk to your baby wait till he or she turns one. For children who are anemic or at a risk of being anemic, oral supplements can be started after consulting the doctor or pediatrician. Iron supplements are available in forms of drops, syrups and tablets for children of different ages and needs. The American Academy of Pediatricians recommends all infants between 9-12 months be checked for iron deficiency and dealt accordingly. It is always good to be regular with checkups regarding your children’s health. The earlier the deficiency is detected the easier it is to cure it before it turns into a disease.